Andreu Carulla runs his own multidisciplinary design studio in a natural setting just an hour away from Barcelona. And that organic location serves as inspiration for his amazing designs, including the ingenious CarRem, a mobile herb garden designed to hold food, drinks, and plants, allowing guests at the table to choose and enjoy the taste of freshly plucked herbs. 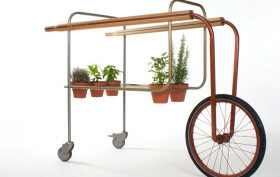 An innovative idea with a minimal aesthetic, this stylish trolley reflects the designer’s Mediterranean lifestyle.